Oxford Film Festival Take 5 With...: Darius Goes West -- get your own! Darius Goes West -- get your own! Finally on DVD -- and just in time for the holidays -- Darius comes to DVD! 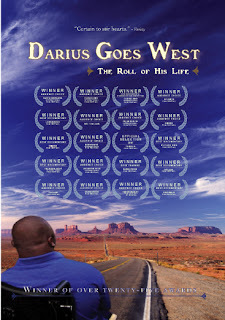 Winner of Best Documentary and Audience Awards at the 2007 Oxford Film Festival, as well as multiple awards at film festivals around the world, Darius Goes West: The Roll of His Life is available for purchase from the film's website. Darius and Logan have appeared recently on the Today Show, and on the Ellen Degeneres show. We are so happy to have been part of their puzzle, and have enjoyed reading their blog.